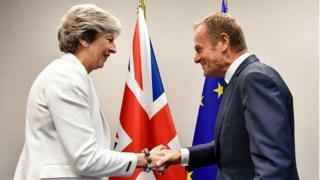 Theresa May is to hold Brexit discussions with the president of the EU Council as the UK seeks to move talks on to a new trade deal. The prime minister and Donald Tusk will meet in Gothenburg on Friday, Mr Tusk's spokesman said on Twitter. The EU has so far refused to discuss the "future relationship", which includes trade, saying not enough progress has been made on "separation issues" like the UK's financial bill. Brexit is expected in March 2019. The UK is hoping that at the EU's December summit, leaders will finally give the green light to discussing the trade deal the UK wants to replace its membership of the European single market. Brexit Secretary David Davis is due to speak at an economic summit in Berlin later, amid speculation about whether the UK will increase its financial offer as part of the separation deal to persuade the EU to progress the talks. Forget about the daily agonies over the Brexit Bill in Parliament - for the government's plans to stay remotely on track, it's the other bill they really need to worry about. The government hopes desperately to be able to move on to the next phase of the EU talks at the leaders' next shindig in mid-December. But all the signals are that the UK is going to have to promise to cough up more cash in order for them to agree. There are good reasons why the UK doesn't want to promise any more money yet. The British side has always wanted to keep the option of writing a big cheque at the last minute on the table. And ministers certainly don't want to pay a penny more of taxpayers' money than we need to in order to get a decent deal with the rest of the continent. The UK says it wants to strike a "comprehensive" trade deal with the EU, to secure tariff-free trade with the bloc, and has said it wants a "bespoke" deal, rather than replicating other countries' arrangements. But documents leaked to the Politico website suggest the EU will only agree to a "standard" free trade deal like the one it has with Canada - an arrangement Mrs May has previously said would be inferior to the current arrangements. In September she said a Canada-style deal would "represent such a restriction on our mutual market access that it would benefit neither of our economies".